The experiment P5.8.5.5 realises a Helium Neon laser from basic parts. The open frame cavity allows the variation of parameters to measure the beam profile for different cavity mirror configurations and distances. The laser tube is equipped with a Brewster's window on both sides allowing the study of polarisation and losses. Optionally, a Littrow prism selects other wavelengths than the main laser line at 632 nm, especially the orange line at 611 nm. Further line tuning is demonstrated by means of the optional birefringent tuner. Four different lines can be demonstrated by this element. 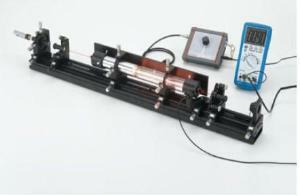 An etalon is used to obtain the single mode operation of the Helium Neon laser.